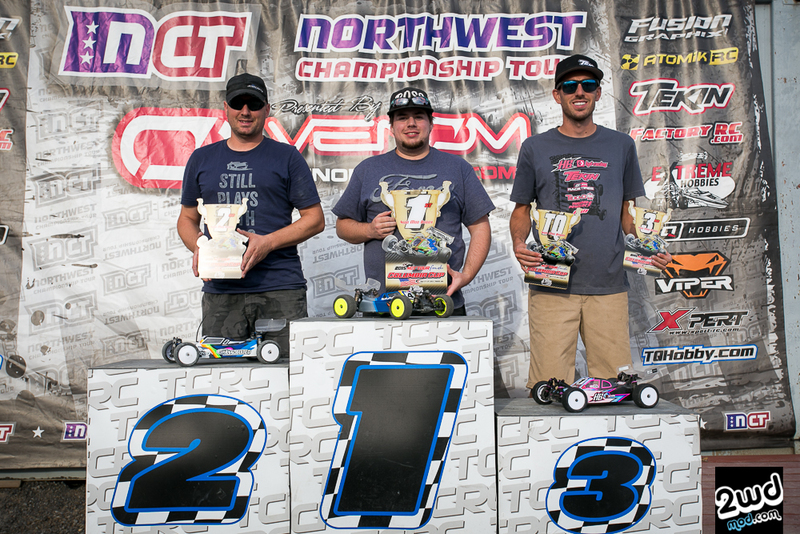 The 6th and final round of the 2015 Northwest Championship Tour was held in Pasco, Washington over a beautiful late summer weekend on September 12th – 13th. 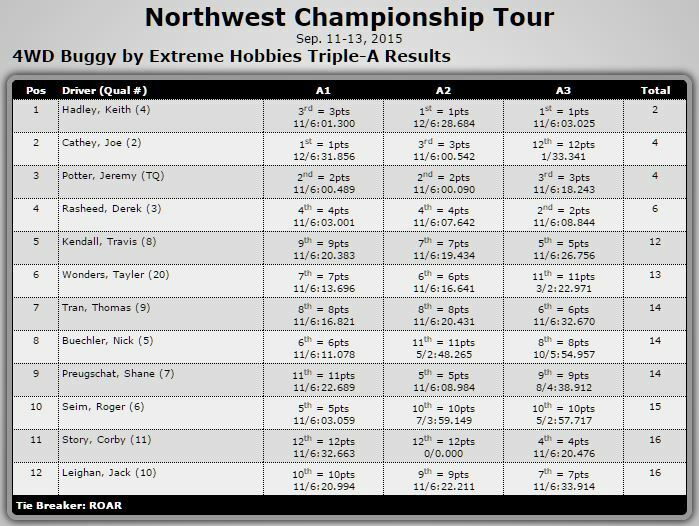 With most of the electric titles already locked up, the 1/8th scale nitro classes were still up for grabs making the final round the most crucial of all. Have a bad round now and the quest for NCT Champion is over. 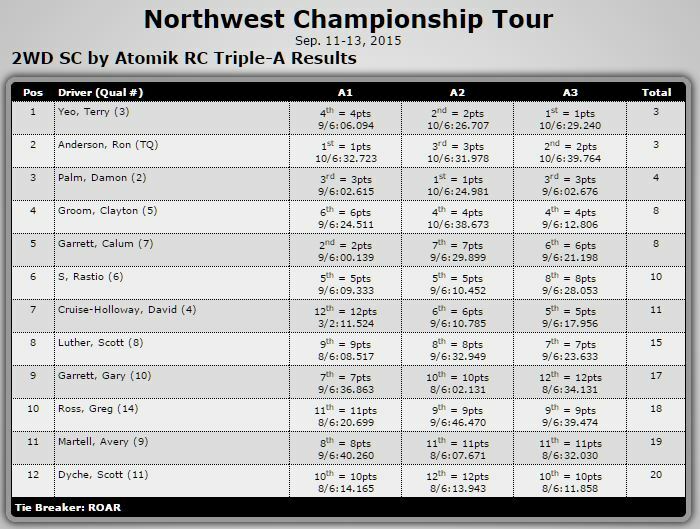 Competition was stiff in all classes, all weekend with nearly 200 entries total……. the action was hotter than the weather in Pasco! 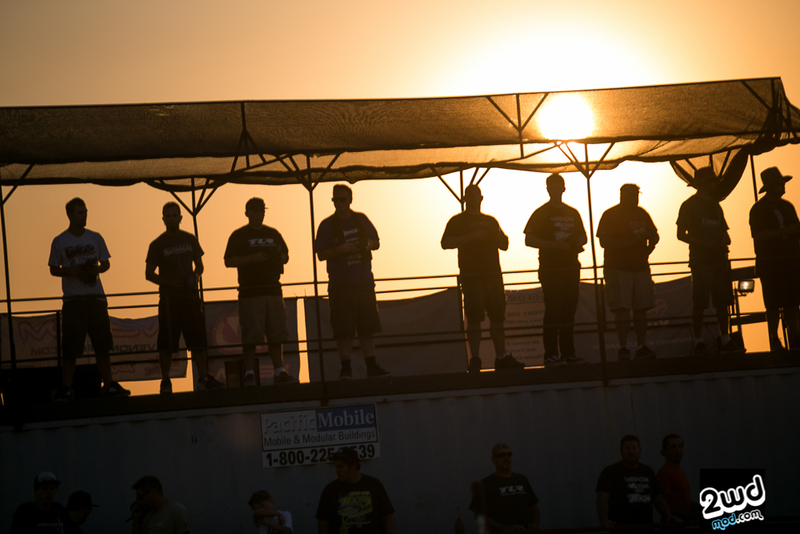 One of the best-hidden gems of the NW for a while now is the Northwest R/C Speedway in Pasco. 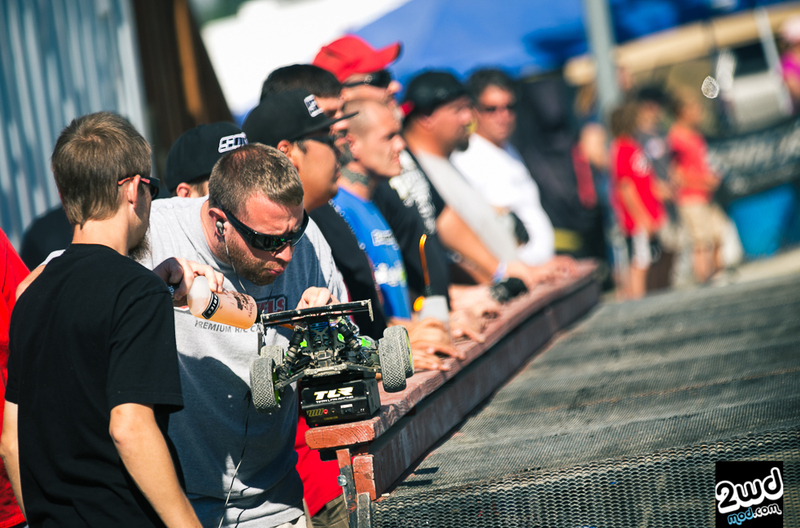 With its 32 second lap times, racers from all over the NW were treated to a high-speed, highly technical layout. With features mixed with great flow, the layout made for a lot of great racing that required precision at high speeds. Add in wind and extreme heat from mother nature, the conditions were ever changing and always challenging. 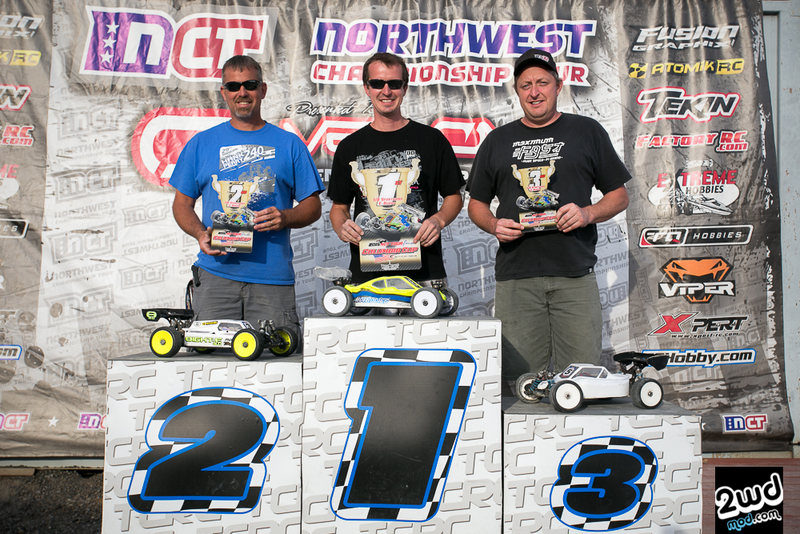 From start to finish, the crew at TCRC did a fantastic job and many thanks go out to NCT organizer Darren Shank and his crew for all their effort in getting the track ready and maintained all weekend long. 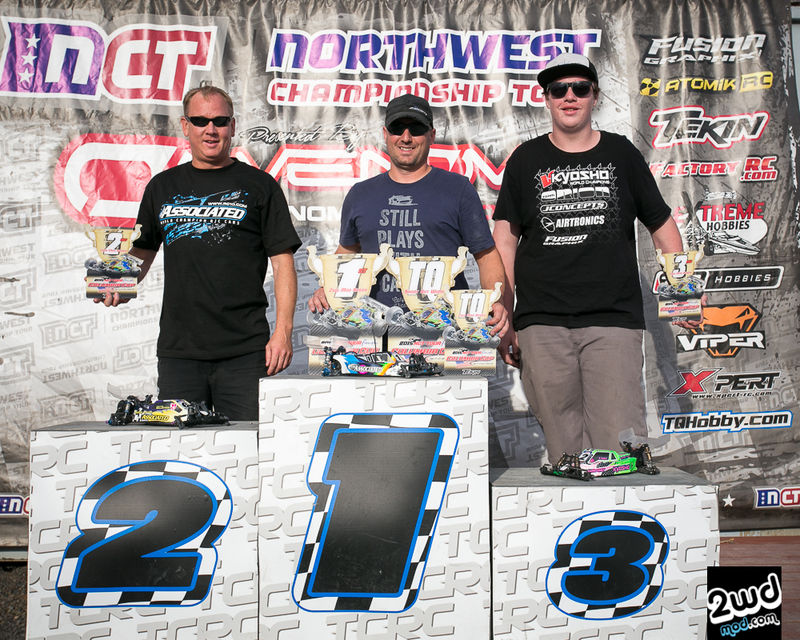 The racing format was a standard Friday practice, Saturday with 3 qualifiers, and Sunday saved for triple A-mains in electric and 30 minute in nitro. In years past 1/10th electric races ran during the AM and 1/8th scale electric and nitro would run during the PM. 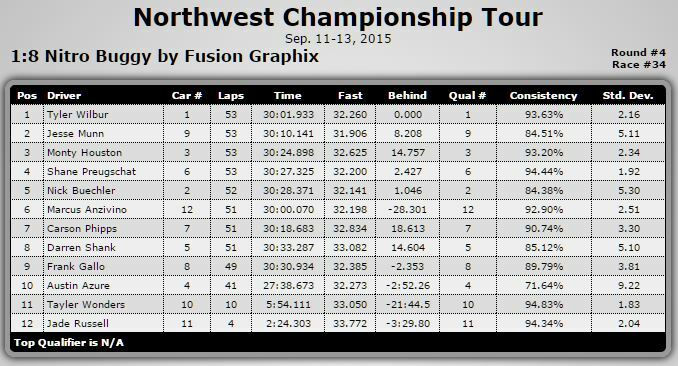 Now they’re both on the same program with 1/8th running after 1/10th finishes their round of qualifying. Another twist to the NCT is that in all the 1/10th electric classes, you are allowed to run whatever you have much like an “open” class. For most racers, the obvious choice is a low turned modified motor, but you have the choice to run whatever motor you thought fit. 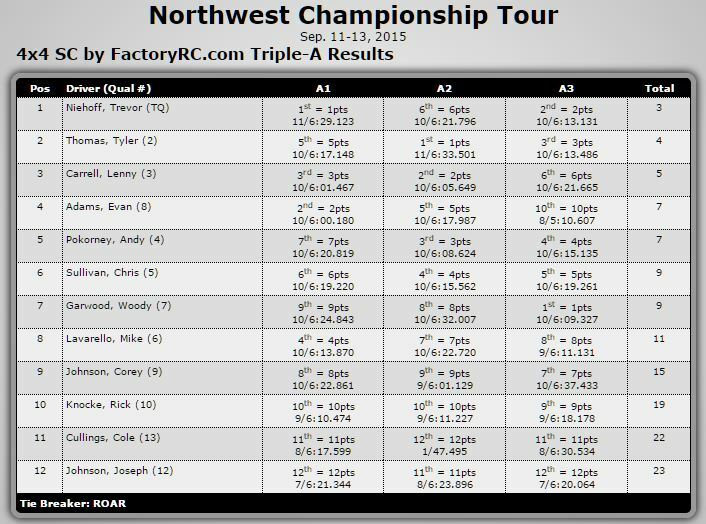 My apologize for the 2wd SC guys for missing the podium picture! The 2wdMod race was full of surprises that kept things interesting. 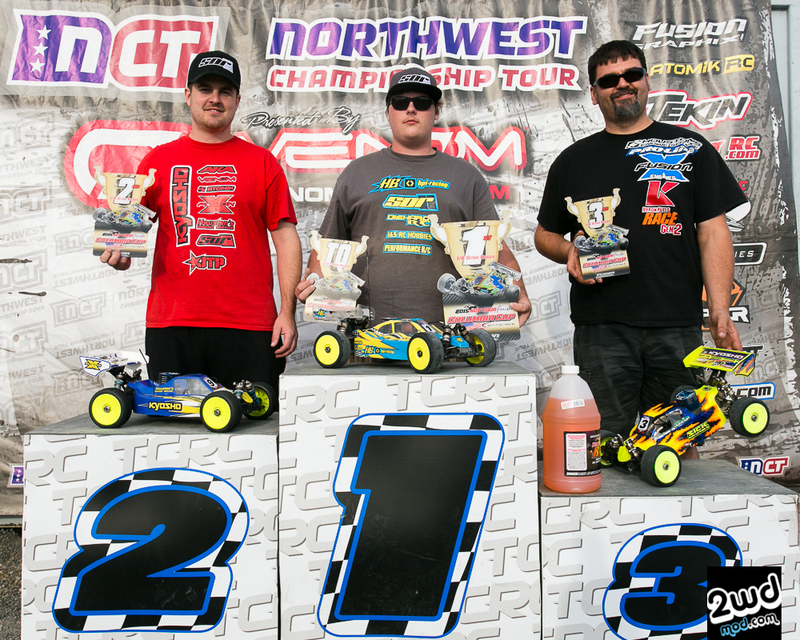 Taking the overall TQ in the best 2 of 3 qualifying rounds was local privateer, Joe Cathey who showed tremendous speed all through qualifying. Looking almost untouchable, Cathey would finally be challenged in A1 when Kyosho/Team Orion’s Tanner Day would charge to the lead and fend off a late charge by Cathey to take the win in A1. A2 had an almost identical 1st half to A1, but the 2nd half was much different. Having made a risky pass over the “Pasco Mound”, Day would make it stick and take the lead from Cathey. Day would slowly increase his margin over Cathey, but unfortunately suffer a blown hub bearing and was forced to retire early. 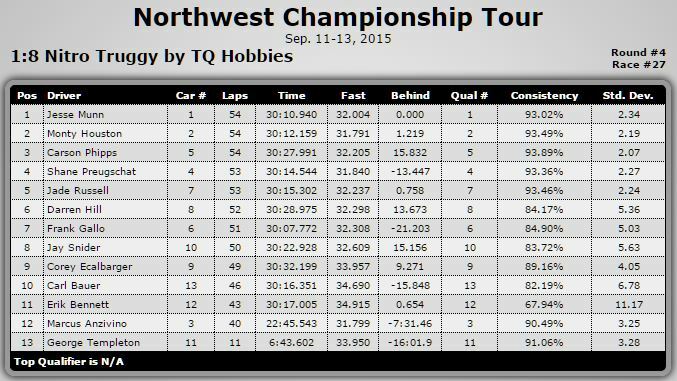 Cathey would take the win with Dave Gullickson in 2nd and Kyosho’s Roger Seim in 3rd. The final main was set for an epic showdown between Cathey and Day as both drivers had a 1 win a piece. However, while jumping the double that goes onto the straightaway, Cathey would over cook the difficult double and slap spin his B5M into oncoming traffic. With nowhere to go and already airborne, Day would collide with Cathey that resulted in Day needing to get cornered among a free-for-all that shortly ensued. With Day out of the battle, Cathey would coast to his 2nd win and claim the overall. 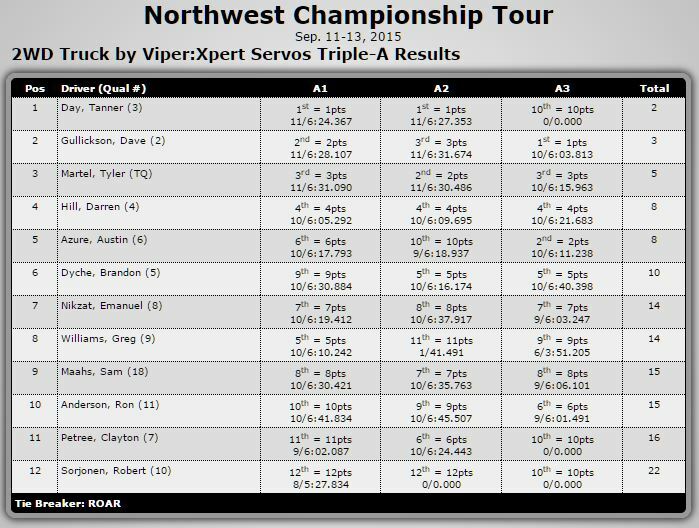 Derek Rasheed would finish 2nd and Gullickson 3rd for A3. Cathey would take the overall with Gullickson edging out Day in the tie-breaker for 2nd. The nitro truggy class was simply unbelievable. 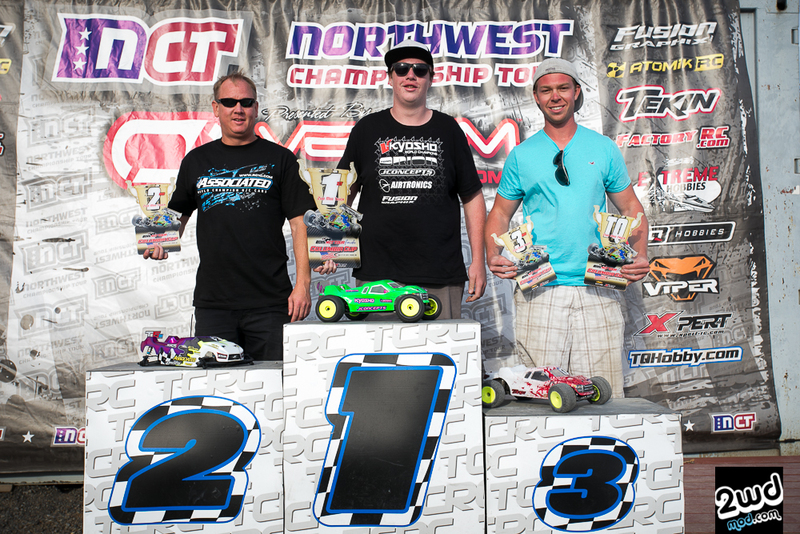 Kyosho’s Jesse Munn would TQ the truggy class, but the TQ was short lived during the 30 minute main. While struggling to find his rhythm early on, Munn would drop back to 2nd for almost the entire race. Monty Houston would take the lead from the 2nd lap and start to pull away from the field. Meanwhile Munn was defending his 2nd place position, he was unable to find his groove until late in the race. Never giving up, Munn would slowly start to close the gap to Houston and the race was on. With the crowd wondering if there would be enough time to for Munn to challenge Houston, it finally happened. Houston would have a slight incident with lapped traffic, this allowed Munn to fully close the gap and was able to pressure Houston into a small mistake that allowed Munn to sneak by. After taking the lead, Munn would defend attacks from Houston for the final 2 laps to take the win. 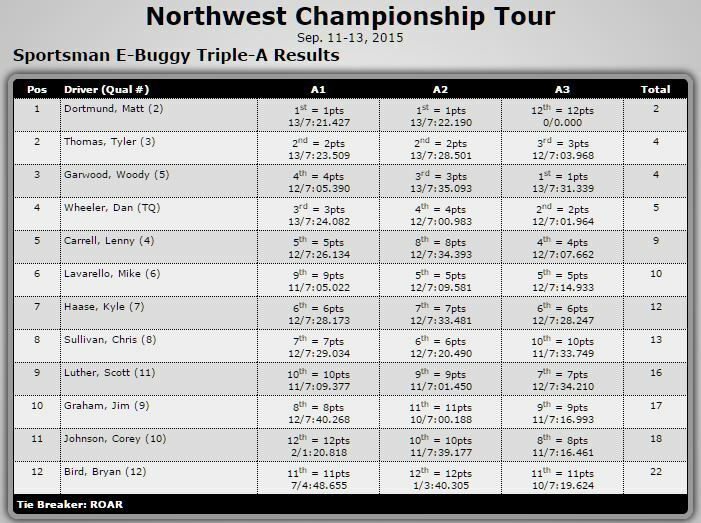 Also by taking the win in the finale round, Munn would catapult from 11th in points to take the overall and is your 2015 NCT Truggy Champion! Finishing only 2 seconds back, Houston would finish 2nd and Hot Bodies’ young talent, Carson Phipps, would finish 3rd on the podium! Hot Bodies Tyler Wilbur was on point during the entire 30 minute main. From start to finish, Wilbur was in full control as he was able to dictate the pace from the very beginning and his pace was fast! With his competitors unable to match his insanely quick start, Wilbur was out in front putting in solid clean laps. Struggling to put in decent qualifying runs, Kyosho’s Jesse Munn found himself playing the bump game from the C-main, to the B, and finally starting 9th in the A. Obviously, all that track time must have paid dividends as Munn was able to make his way through the field and work down Wilbur’s lead. Unfortunately for Munn, a flame out on the track and in the pits made it difficult to overcome the gap, but would still manage to find a way to finish 2nd and only 9 seconds back from Wilbur. Wilbur takes the win with Munn in 2nd and Monty Houston 3rd. Houston would battle back throughout the entire race to finally take over 3rd from TLR’s Shane Preugschat late in the race. 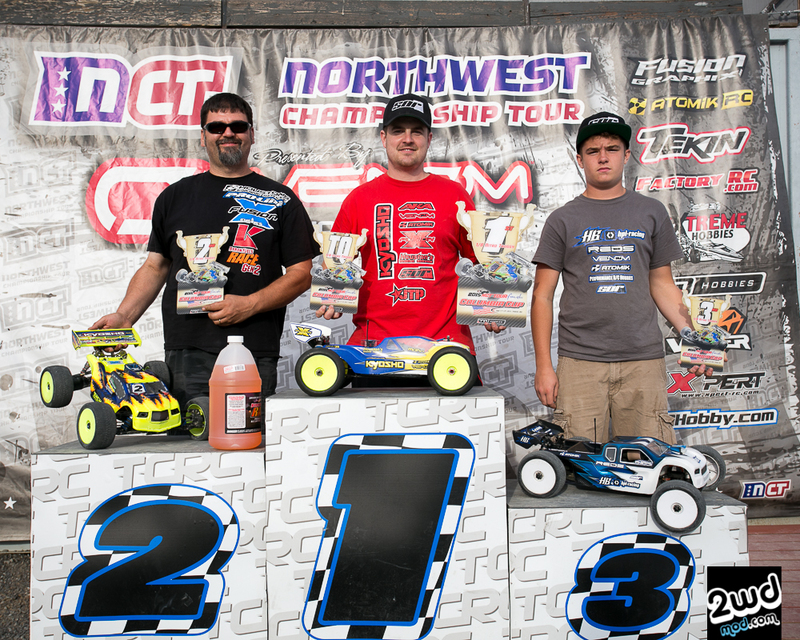 With a 2nd place finish in today’s race, Munn would seal up the overall and become the 2015 NCT Champion in 1/8th nitro buggy! Please check out the photo epic soon as well as this post has become far too long already! 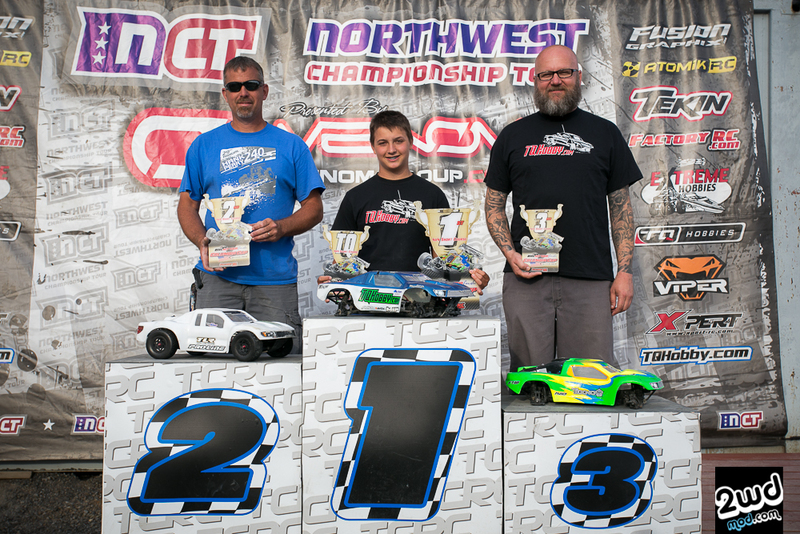 Tags: 2015, 2wdmod, hb, jesse munn, kyosho, mp9, NCT, offroad, pasco, racing, report, round 6. Bookmark the permalink.